Statistics reveal that men are more likely to suffer from subdued sexual performance although the cause; whether it is physical or psychological is still an area of extensive research. The direct result of this scenario are low chances of fertility. Further, an unhealthy lifestyle can inhibit the secretion of hormones that promote sperm production. Pharmaceuticals have developed a host of products that provide an assured solution to the ages old problems of infertility in men. Though the results are still a subject of debate, their consumption is seeing an abrupt increase. However, there may be an easier and cheaper home solution to your problem. This is by including in your diet certain food items that have well documented fertility enhancing properties. These can help increase your libido, and promote the better production of sperm cells. The most important food ingredients of these have been included in the list below. However, readers should note that the list is not all inclusive. Salmon – Marine fish products that contain a high concentration of fatty acids and omega 3 constitute an ideal diet. Both these compounds promote the release of hormones that lead to enhanced sperm production. At the same time, they have other health benefits as well. Pomegranate Juice – This fruit can be an elixir for enhanced fertility in men. Fortified with folic acid to improve blood cells production and thereby promote better circulation, pomegranates can cause a significant increase in the probability of conception. Pumpkin Juice/Seeds – Zinc is a well documented ingredient to eliminate occurrences of men infertility. Pumpkin is the ideal vegetable if you are looking to add to your intake of zinc. Zinc leads to a better sperm count in men. Fish – Sea water fishes with a high concentration of fatty acids can be of great help in your quest of becoming a parent. An added constituent in omega 3. Shell Foods – Shell foods such as oysters invariably contains a high concentration of amino acids. These are important regulators in the production of male hormones and would definitely be of great help if you are trying to become pregnant. Broccoli – Green vegetables should invariably constitute a chunk of your intake. This is more so if you are trying to conceive. Vegetables such as broccoli contain a high amount of phytosterols. These promote enhanced secretion of hormones in men. Brown Rice – Brown rice contains a considerable amount of carbohydrates and folic acids. It can be useful to maintain the amount of insulin in the body. 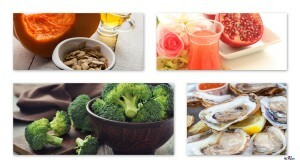 The above list includes some of the most common dietary solutions to infertility in men. However, merely intake of these items may not produce the desired or instant results. Often, there is a parallel list of food items you need to avoid. This would invariably include red meat and alcohol. Some sort of balanced lifestyle need to be maintained as well. However, these food are not substitutes for professional medical help for conditions that are more acute.